I never was a big fan of bread stuffing — it was either the texture or the spices or both. So when I found out I was allergic to wheat in 2005, I figured I could go without stuffing. But I realized it’s nice to have an alternative to such holiday staples, just so I don’t feel like I’m limiting myself. 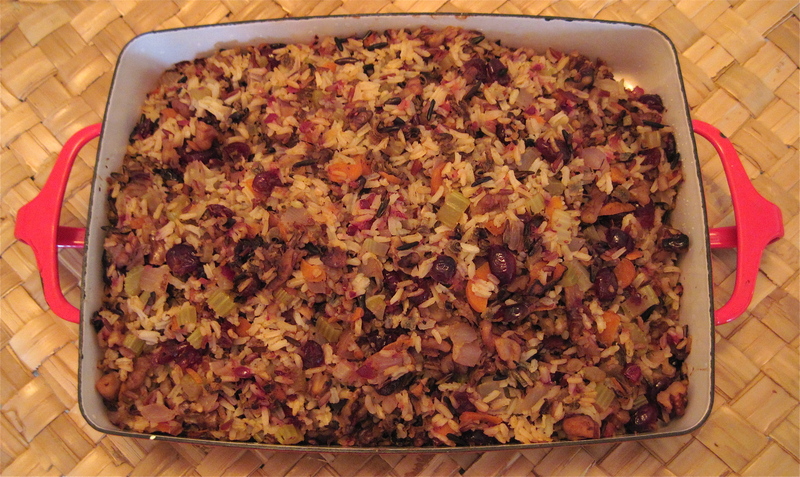 Over the past few years, I’ve made a number of rice-based “stuffing” alternatives, usually by following recipes. This year, I showed my mom two rice stuffing recipes from Cooking Light and asked her which she thought would be better or easier to make. Now, my mom isn’t really big on recipes. Or measuring. Or using ingredients she doesn’t buy regularly. So she suggested I combine both recipes and modify them slightly to make life easier. We then combined the rice (and remaining liquid) with the vegetable-fruit-nut mixture and added a liberal amount of poultry seasoning (for the sage and thyme) and a little Mrs. Dash’s Table Blend. We baked it for about 20 minutes or so. While not life-changing like the pumpkin pie I made, this stuffing was fantastic and required little effort or skill. The rice was done perfectly and did not stick to itself. The flavor was spiced just right, and the fresh cranberries added a nice freshness … for lack of a better word. Anyone else have any good gluten-free stuffing recipes? « Thanksgiving 2011 success #1: Gluten-free, vegan, soy-free pumpkin pie!